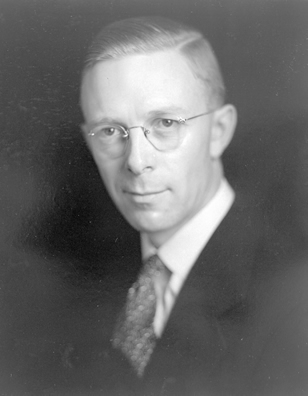 Adkins, W. E. Report to the Board of Trustees on the Oil Sands Project from Inception to December 31, 1948. Report with construction details, photos and plans. 1948. PR 1971.356/505/Box 24. Provincial Archives of Alberta, Edmonton, AB. —. 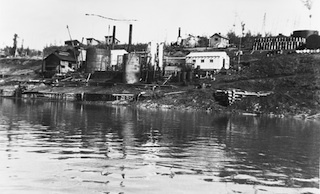 “Separation Plant Reclaims Oil from Athabaska Sands.” Reprint, The Oil and Gas Journal, March 22, 1947. 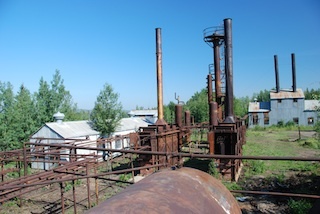 PR1991.0539/14. Provincial Archives of Alberta, Edmonton, AB. —. 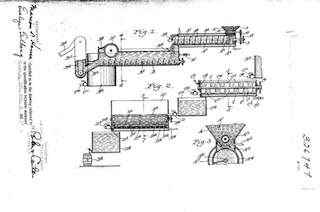 “New Plant to Process Athabaska Oil Sands.” Reprint, The Petroleum Engineer (April 1948). PR1971.356/290/Box 15. Provincial Archives of Alberta, Edmonton, AB. Anon. “Athabasca Tar Sands: Staggering Deposits of Valuable Crude Oil in The Tar Sands of Fort McMurray District For Commercial Purposes Estimated Fuel Oil for 500 Years.” Strathcona Weekly News, January [ ], 1932. —. 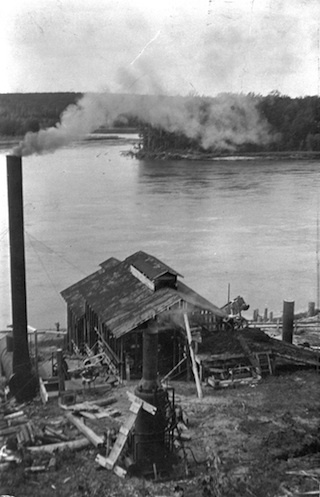 Oil Sands Limited Plant, 1944. 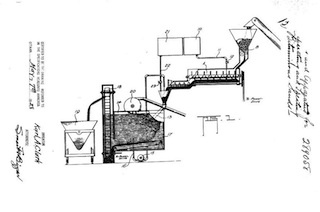 Report with as-found diagram of separation plant. 1944. PR1991.539/15. Provincial Archives of Alberta, Edmonton, AB. Ball, Max. 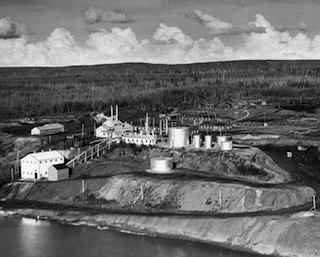 Transactions, Volume XLIV, 1941: Development of the Athabaska Oil Sands. The Canadian Institute of Mining and Metallurgy, 1941. Berkowitz, Norbert and James G. Speight. “The Oil Sands of Alberta.” Reprint. Fuel 54 (July 1975): 138-149. Blair, Sidney Martin. 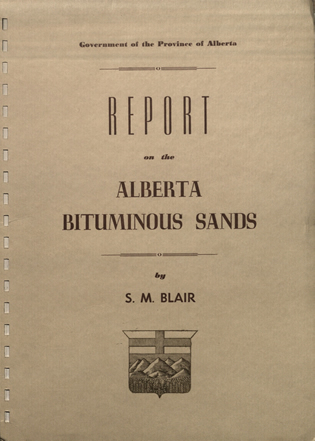 Report on the Alberta Bituminous Sands. Edmonton: Government of the Province of Alberta, 1950. Blair, Sidney. Convocation Address. University of Alberta, Edmonton, May 30, 1975. Born Engineering Fonds. Letters, articles, publications, clippings & photos. PR1991.0539. Provincial Archives of Alberta. Bott, Robert. Canada’s Oil Sands and Heavy Oil. Calgary: Petroleum Communication Foundation, 2000. Canadian Association of Petroleum Producers. “The Facts on Oil Sands.” http://www.capp.ca/getdoc.aspx?DocId=220513&DT=NTV (accessed May 2013). —. “What are Oil Sands?” http://www.oilsandstoday.ca/whatareoilsands/Pages/default.aspx (accessed May 2013). Carrigy, M. A., ed. Athabasca Oil Sands–The Karl A. Clark Volume. Edmonton: Research Council of Alberta, 1963. 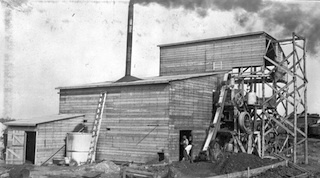 Carrigy, M. A. Athabasca Oil Sands—Bibliography (1789-1964). Edmonton: Research Council of Alberta, 1965. Cass, Doug. “Canadian Petroleum History Bibliography.” Petroleum History Society http://www.petroleumhistory.ca/history/phsBiblio2011-01.pdf. (accessed May 2013). Centre for Energy. “What Are Oil Sands and Heavy Oil?” About Energy. http://www.centreforenergy.com/AboutEnergy/ONG/OilsandsHeavyOil/Overview.asp?page=1 (accessed May 2013). Chastko, Paul. 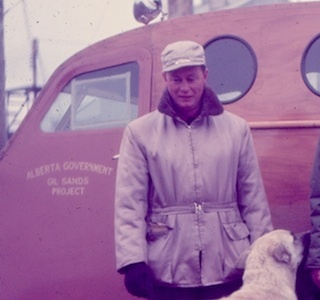 Developing Alberta’s Oil Sands: From Karl Clark to Kyoto. Calgary: University of Calgary Press, 2004. Clark, Karl A. “Athabasca Bituminous Sands.” Reprint, Fuel 30 (1951). —. “The Athabasca Oil Sands.” Reprint, n.d. PR1971.356/290/Box 15. Provincial Archives of Alberta, Edmonton, AB. —. “The Athabaska Tar Sands.” Reprint, Scientific American (May 1949). PR1971.356/290/Box 15. Provincial Archives of Alberta, Edmonton, AB. —. “Commercial Development Feasible for Alberta’s Bituminous Sands.” Reprint, Canadian Oil and Gas Industries (October 1951). PR1971.356/290/Box 15. Provincial Archives of Alberta, Edmonton, AB. —. 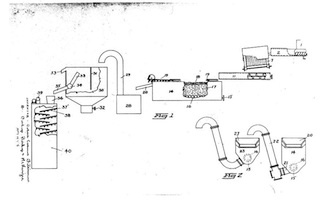 “The Hot Water Washing Method for the Recovery of Oil from the Alberta Tar Sands.” Reprint, Canadian Oil and Gas Industries (September 1950). PR1971.356/504b/Box 24. Provincial Archives of Alberta, Edmonton, AB. —. Guide to the Alberta Oil Sand Area along the Athabasca River between McMurray and Bitumount and to the Oil Sand Separation Plant of the Government of Alberta at Bitumount. Edmonton: Government of Alberta, 1951. —. “Report on Trip to Bitumount during July, 1945.” Unpublished manuscript, July 1945. Clark, Karl A. and S.M. Blair. The Bituminous Sands of Alberta. Edmonton: Scientific & Industrial Research Council of Alberta, 1927. 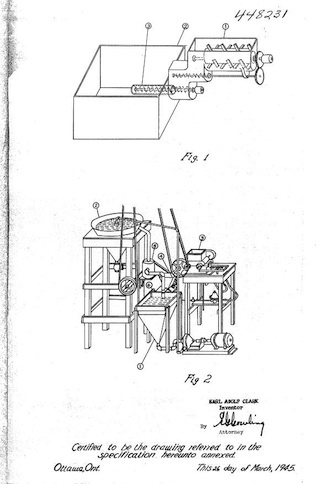 Conly, F. M., R. W. Crosley, and J. V. Headley. “Characterizing Sediment Sources and Natural Hydrocarbon Inputs in the Lower Athabasca River, Canada.” Journal of Environmental Engineering and Science 1, no. 1 (2002): 138-149. D. S. Pasternack Fonds. Photographs. PR1969.0114. Provincial Archives of Alberta, Edmonton, AB. 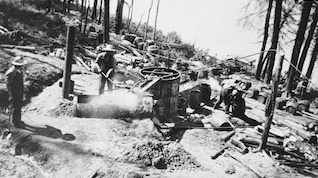 Ells, S. C. “Research Touches the North – Commercial Potentialities of Alberta’s Bituminous Sands—to Meet Allied Oil Needs for Times of Peace and War.” Canadian Geographical Journal 24, no. 6 (June 1942): 256-267. Everard, Harry F. Report by Harry F. Everard, Refinery Engineer in Charge of Erection and Supervision of Refinery International Bitumen Company, Ltd. Report with plans and elevations for new refinery at Bitumount. Edmonton: July 17, 1936. PR1971.356/290/Box 15. Provincial Archives of Alberta, Edmonton, AB. “Facts about Alberta’s Oil Sands and Its Industry.” Oil Sands Discovery Centre. http://history.alberta.ca/oilsands/resources/docs/facts_sheets09.pdf (accessed May 2013). Ferguson, Barry Glen. Athabasca Oil Sands: Northern Resource Exploration 1875-1951. Edmonton: Alberta Culture/Canadian Plains Research Centre, 1985. Fitzgerald, J. Joseph. 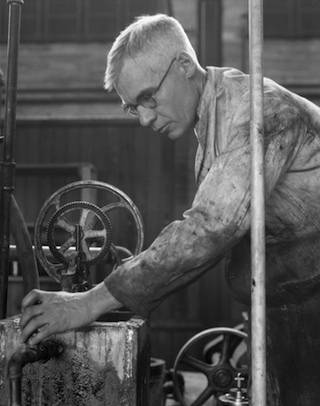 Black Gold with Grit: The Alberta Oil Sands. Sidney, BC: Gray’s Publishing Ltd., 1978. Fitzsimmons Fonds. Letters, articles, publications, clippings & photographs. PR1971.0356. Provincial Archives of Alberta, Edmonton, AB. Fitzsimmons, R. C. The Truth about Alberta Tar Sands: Why Were They Kept Out of Production? Edmonton: 1953. 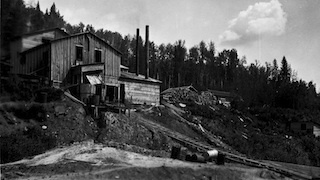 Flach, P. D. Oil Sands Geology – Athabasca Deposit North. Edmonton: Geological Survey Department, Alberta Research Council, 1984. Gingras, M. and D. Rokosh. “A Brief Overview of the Geology of Heavy Oil, Bitumen and Oil Sand Deposits,” Great Explorations—Canada and Beyond. 2004 CSEG National Convention. http://cseg.ca/assets/files/resources/abstracts/2004/122S0227-Gingras_M_heavy_oil_bitumen_oil_sands.pdf (accessed May 2013). Government of Alberta. “About Oil Sands.” Alberta Energy. http://www.energy.gov.ab.ca/OilSands/585.asp (accessed May 2013). —. “Oil Sand Tailings.” March 2013. http://www.oilsands.alberta.ca /FactSheets/Tailings_FSht_Mar_2013_Dft_1(1).pdf. —. “Upgrading and Refining.” March 31, 2013. http://www.energy.gov.ab.ca/Oil/pdfs/FSRefiningUpgrading.pdf. Government of Canada. “Canadian Intellectual Property Office.” http://www.cipo.ic.gc.ca/eic/site/cipointernet-internetopic.nsf/eng/Home (accessed May 2013). Gray, Earle. The Great Canadian Oil Patch. Toronto: McLean-Hunter Ltd., 1970. Gray, G. R. and R. Luhning. “Bitumen.” The Canadian Encyclopedia. 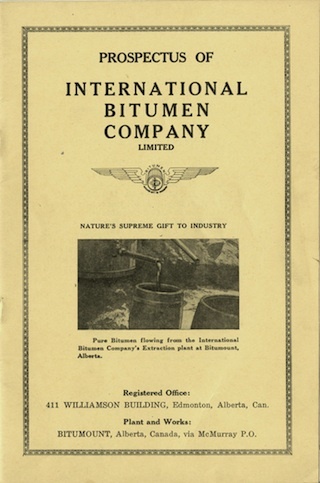 http://www.thecanadianencyclopedia.com/articles/bitumen (accessed May 2013). Gray, Murray R. Extraction and Upgrading of Oilsands Bitumen: Intensive Short Course. Edmonton: University of Alberta, 1998. Heritage Community Foundation. “Algae, Bacteria and Bitumen.” Resource Inventory. http://www.collectionscanada.gc.ca/eppp-archive/100/205/301/ic/cdc/www.abheritage.ca/abresources/inventory/resources_hydro_oilsands_algae.html (accessed May 2013). Hills, L. V. Oil Sands—Fuel of the Future. Calgary: Canadian Society of Petroleum Geologists, 1974. Hodgson, G. W. “The McMurray Oil Field.” Alberta Society of Petroleum Geologists News Bulletin 2, no. 3 (March, 1953): 2-3. Hunt, Joyce E. Local Push, Global Pull: The Untold History of the Athabaska Oil Sands 1900-1930. Calgary: PushPull, Ltd., 2011. Karl A. Clark Fonds. Letters, articles, clippings & photos. PR1968.0015. Provincial Archives of Alberta, Edmonton, AB. Karl Clark Fonds. Photographs, letters, documents. 68-9-296, 91-137. University of Alberta Archives, Edmonton, AB. 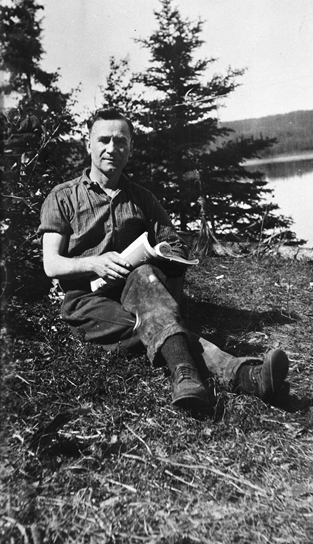 Lloyd R. Champion Fonds. Photographs, letters, reports, University of Alberta Archives. 83-160. Morimoto, Tom. Breaking Trail: from Canada’s Northern Frontier to the Oil Fields of Dubai: A Memoir, a History. Calgary: Fifth House, 2007. 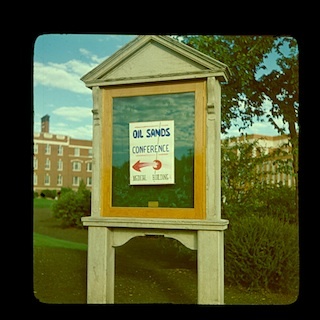 Ness, R. C. “Results of Oil Sands Project Discussed by Technical Group.” Reprint, n.d. PR1971.356/290/Box 15. Provincial Archives of Alberta, Edmonton, AB. O’Donnell, Cynthia. 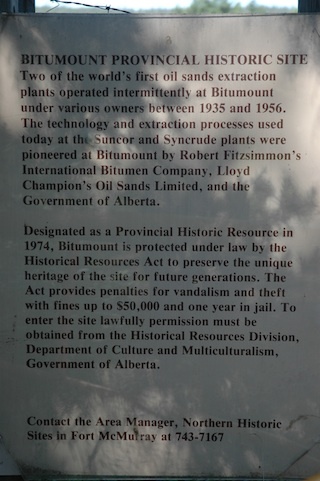 Bitumount: A History of the Pioneers of the Oil Sands Industry. Edmonton: Alberta Culture and Multiculturalism, n.d.
Parker, James M. and Kenneth W. Tingley. History of the Athabasca Oil Sands Region, 1890 to 1960’s Report, Volume I: Socio-Economic Development. Edmonton: Alberta Oil Sands Environmental Research Program, 1980. Pasternack, D.S. “Alberta Oil Sands.” Reprint, The Petroleum Engineer (February 1953). PR1971.356/290/Box 15. Provincial Archives of Alberta, Edmonton, AB. Sheppard, Mary Clark, ed. 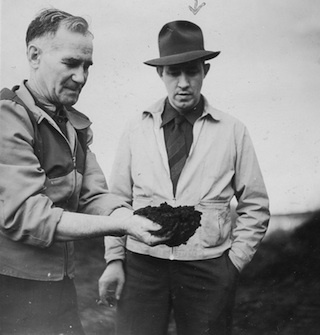 Oil Sands Scientist: The Letters of Karl A. Clark, 1920-1949. Edmonton: The University of Alberta Press / Alberta Culture and Multiculturalism, 1989. —. 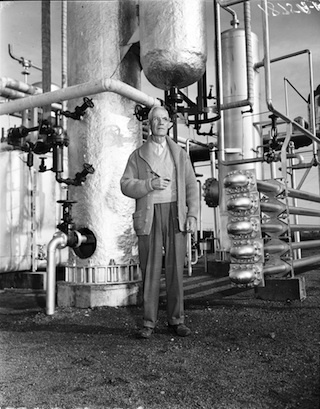 Athabasca Oil Sands: From Laboratory to Production, The Letters of Karl A. Clark, 1950-66. Sherwood Park, AB: Geoscience Publishing, 2005. Sidney Martin Blair Fonds. Photographs. 85-53. University of Alberta Archives, Edmonton, AB. Smith, A. J. and J. M. McClave. The Commercial Utilization of the Oil Sands of Northern Alberta. Presentation to the 18th Annual Western Meeting of the Canadian Institute of Mining and Metallurgy, Edmonton: October 1, 1936. PR1971.356/487/Box16. Provincial Archives of Alberta, Edmonton, AB. Somerville, H. H. Notes for Speech on History of the Great Canadian Oil Sands. 91-137, Box 1. University of Alberta Archives, Edmonton, AB. Speight, James G. and Baki Özüm. Petroleum Refining Processes. New York: Marcel Dekker, Inc., 2002. Sweeny, Alistair. Black Bonanza: Alberta’s Oil Sands and the Race to Secure North America’s Energy Future. Mississauga, ON: John Wiley & Sons Canada Ltd., 2010. William Elmer Adkins Fonds. Photographs. 82-139. University of Alberta Archives, Edmonton, AB.